The sustainable growth rate is the rate of growth that a company can expect to see in the long term. Often referred to as G, the sustainable growth rate can be calculated by multiplying a company’s earnings retention rate by its return on equityReturn on Equity (ROE)Return on Equity (ROE) is a measure of a company’s profitability that takes a company’s annual return (net income) divided by the value of its total shareholders' equity (i.e. 12%). ROE combines the income statement and the balance sheet as the net income or profit is compared to the shareholders’ equity.. The growth rate can be calculated on a historical basis and averaged in order to determine the company’s average growth rate since its inception. The sustainable growth rate is an indicator of what stage a company is in, in its life cycleBusiness Life CycleThe business life cycle is the progression of a business and its phases over time, and is most commonly divided into five stages: launch, growth, shake-out, maturity, and decline. The cycle is shown on a graph with the horizontal axis as time, and the vertical axis as dollars or various financial metrics.. Understanding where a company is in its life cycle is important. The position often determines corporate finance objectives such as what sources of financing to use, dividend payout policies, or overall competitive strategy. The growth ratio can also be used by creditors to determine the likelihood of a company defaulting on its loans. A high growth rate may indicate the company is focusing on investing in R&DResearch and Development (R&D)Research and Development (R&D) is a process by which a company obtains new knowledge and works on the introduction and improvement of its products and and NPV-positive projects, which may delay the repayment of debt. A high growth rate company is generally considered riskier, as it likely sees greater earnings volatility from period to period. 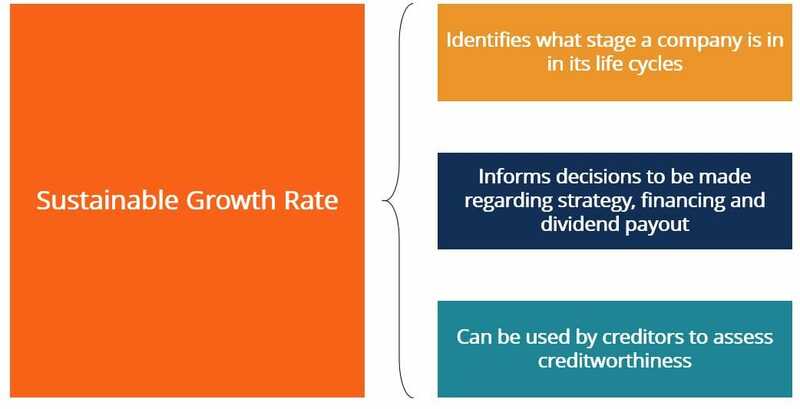 How to Calculate the Sustainable Growth Rate? Retention Rate – [ (Net Income – Dividends) / Net Income) ]. This represents the percentage of earnings that the company has not paid out in dividends. In other words how much profit the company retains, where Net Income – Dividends is equal to Retained Earnings. Return on Equity – (Net Income / Total Shareholder’s Equity). This represents how much return investors have realized relative to the profit the company has generated. A very high growth rate signifies that a company is still growing very quickly. As such, the company may be spending a lot of its earnings on research and development and may not have a lot of cash left over to make debt payments. Therefore, a growing company could benefit more from equity financingDebt vs Equity FinancingDebt vs Equity - which is best for your business and why? The simple answer is that it depends. The equity versus debt decision relies on a large number and issuing stock to finance its operations. Another reason why issuing equity may be a good idea for growing businesses is that growing companies are in a better position to compensate equity investors. Stockholders seek capital gains, meaning that the company does not have to make costly periodic cash payments. It can instead channel funds to business development. As we can see, the sustainable growth rate of Mary’s Tacos hovers around the 10% mark. To better understand the financial health of the business, the sustainable growth rate should be computed for a number of companies that operate in the same industry. If some other firms operating in this industry see ratios that are, on average, lower than Mary’s, we can conclude that the business is growing quickly and outperforming its competition. This would imply that it may be best for Mary’s to utilize equity financing over debt financing, due to the cash flow constraints that come with interest payments. Mary’s may also choose to pursue a more aggressive corporate development strategy in order to sustain its growth and further penetrate the market.